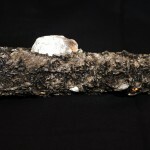 Home / Crystals & Minerals / Muscovite / Muscovite on Albite 2 1/2" x 1 1/2"
Muscovite on Albite 2 1/2" x 1 1/2"
Usually white in color, albite is a member of the plagioclase feldspar group. 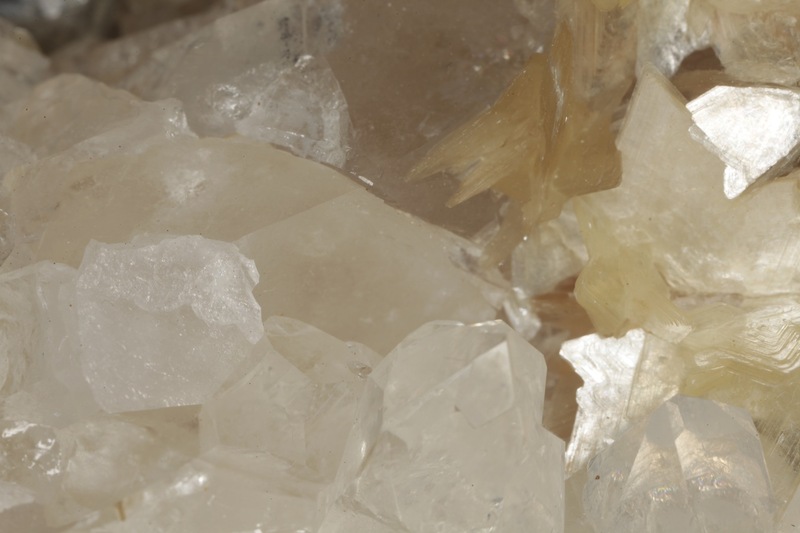 Albite can also be yellow-white, pink or green in color. HISTORY, NAME, LOCALITIES: Muscovite has been known since antiquity when it was called “white mica” and used in powdered form to whiten paints. In 1850, it was assigned its name, which stems from the Russian principality of Muscovia (Moscow), where thin sheets called “isinglass” were used as a substitute for glass in windows and ovens. 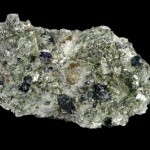 Notable collecting localities are found in Namibia, Russia, Brazil, Pakistan, Malawi, Austria, Madagascar, and the United States (Maine, Vermont, South Dakota, Colorado, New Mexico, California, Virginia). MINERALOGY, PROPERTIES, OCCURRENCE: Muscovite [basic potassium aluminum silicate, KAl2ALSi3O10(OH)2], pronounced MUSS-coh-vite, crystallizes in the monoclinic system as thin, tough, elastic, sheet-like crystals aligned parallel to its perfect, one directional cleavage. 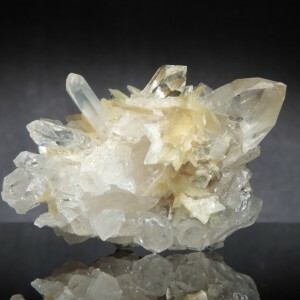 Muscovite is a phyllosilicate mineral with a Mohs hardness of 2.0-2.5, vitreous-to-pearly luster, specific gravity of 2.7-3.0, and tendency to form aggregates of well-developed crystals called “mica books.” Muscovite cleaves easily into thin, semi-transparent, silvery-white sheets. 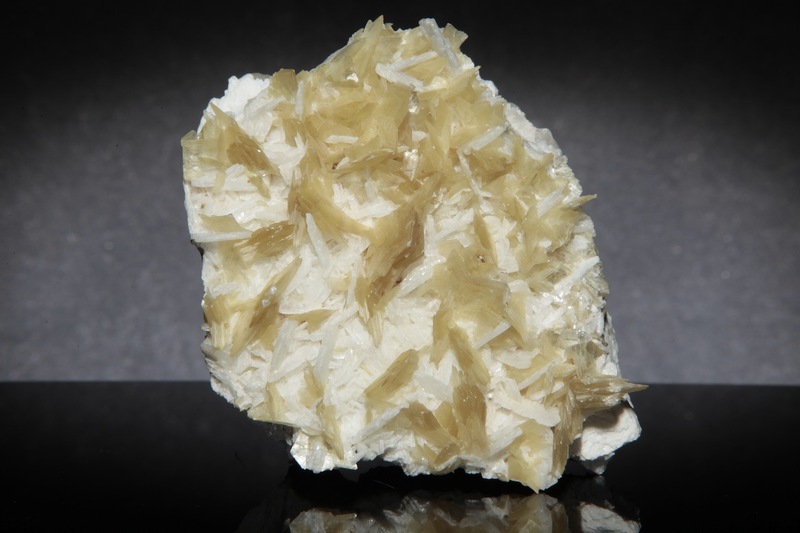 As an abundant rock-forming mineral, muscovite is an essential component of many igneous, metamorphic, and sedimentary rocks and achieves its best crystal development in granite pegmatites. 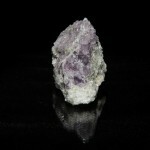 METAPHYSICAL PROPERTIES; LORE, USES: Metaphysical practitioners believe that muscovite aids problem solving, stimulates quickwittedness, and alleviates anger, stress, and self-doubt. 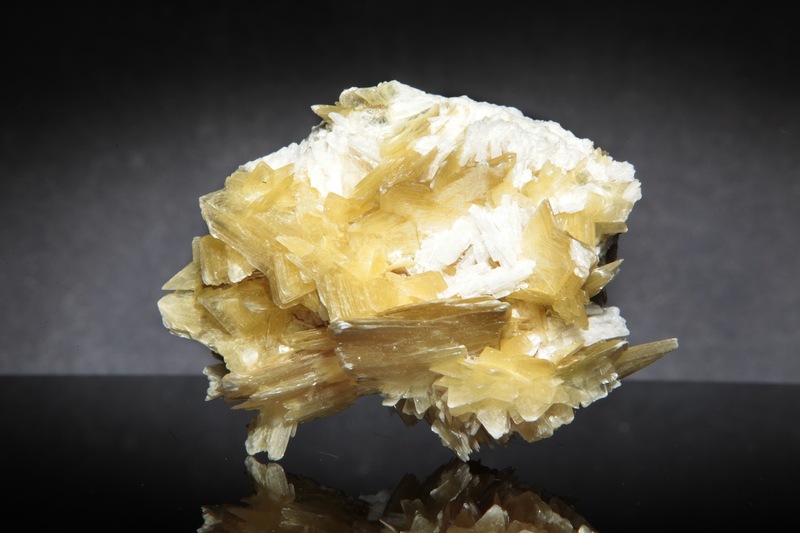 Because of its low coefficients of friction and thermal expansion, inertness, and excellent heat- and electrical-insulating properties, muscovite has many uses in industry and is mined extensively. 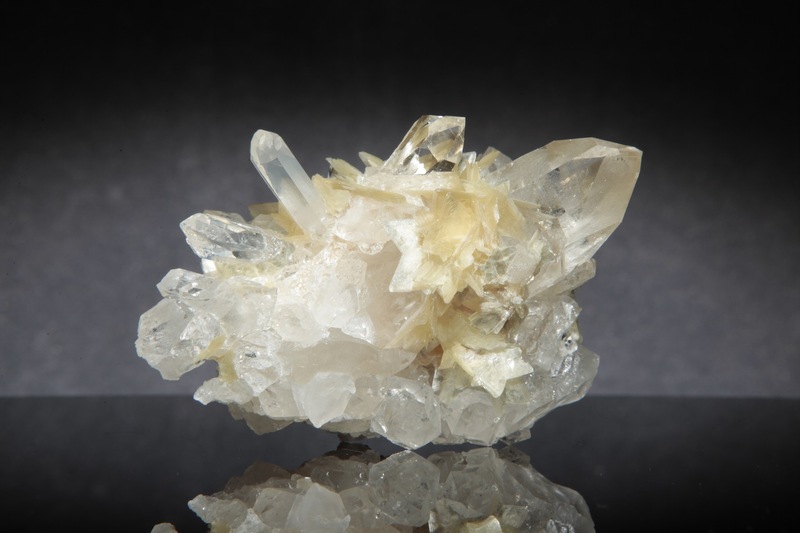 COLLECTING INFORMATION: Muscovite is collected for its unusual crystal forms, usually as composite specimens in association with such pegmatite minerals as beryl, quartz, and microcline. 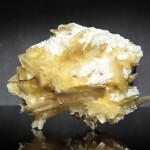 Muscovite with Fluorite 1 1/2" x 1 1/2" x 1/8"
Muscovite on Albite 3" x 2"